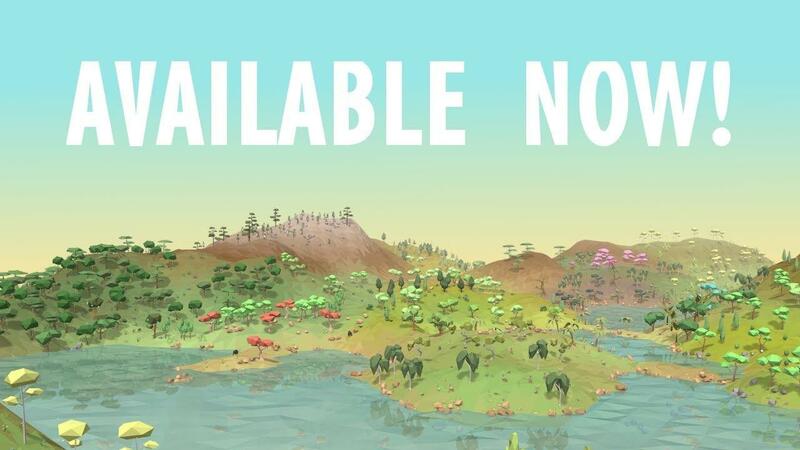 Released back in November last year, Equilinox from developer ThinMatrix is a nature simulation game that feels a little like a city builder. Now that I've had time to sit down and put some time into it, I do have to say that it's a truly lovely experience. What's amazing about indie games, is that I often find they take a lot more risks to get noticed. We get a lot of the same stuff, sure but when games like Equilinox come along it's really nice to see something a bit different stand out in the crowd. Your world starts off as nothing more than a barren wasteland of dirt, lifeless and uninteresting it's up to you to bring it all to life. What starts off as a few bits of grass will soon flourish (with your help) into a rather diverse ecosystem with all kinda of plant and animal life. It's not an evolution sim like other similar games, as I mentioned before it does give off the feeling of a city building sim. You are in control, you're deciding what goes where and not a lot really happens without you intervening. While you do have options to adjust breeds and colours that's mostly it for the evolution side of it. Even so, that part of the game is surprisingly absorbing. I probably spent a good few hours just messing about trying to have a big variation of flower colours to have a big beautiful world. Since release, the developer has supported it well with multiple feature updates including new species of Fish, angry spitting Camels, Coral and Shells as well as optimisations and bug fixes. While it might not be to everyone's taste, I honestly did enjoy the relaxing atmosphere of it. However, it's not without faults though. Well, faults is probably too harsh a word in this case. For one, the game is very structured and surprisingly doesn't have a huge amount of freedom to it. Everything you do, is to progress towards tasks the game sets you and so for the more creative types who just want a more sandbox experience it might not be what you're after. That's probably my main feature request for it, to have a mode where you can just do whatever you want without any set limits, although you would likely exhaust the content pretty quickly doing so. Perhaps it will come in a future update, when they've finished adding in more? Who knows, will keep an eye on it. Either way, I enjoyed it, I got to control a sheep and bounce around which was pretty amusing. Hat tip to Chris for my copy. Equilinox has that odd thing going for it that it looks like a god game but it actually isn't. Still, I love it, as can be seen in my let's play of it. I actually have to stop myself from playing it too much off-camera.